When you hear the word pesticide, does it sound scary? When you hear the word natural, I assume that sounds much more friendly, right? What if we combine the two words — natural pesticide? Just because something is called a pesticide doesn’t mean it’s dangerous to human beings. The Webster dictionary defines pesticide as “an agent used to destroy pests.” In effect, then, almost anything could be a pesticide. Water, for example, could drown an insect or kill a weed, so technically, water is considered a pesticide in some cases. To develop a new synthetic pesticide, it often costs a company approximately $300 million and takes over 10 years. To label a new natural pesticide or another natural product that can enhance crop growth, it may cost as little as $5 million and take as little as three or four years. This, along with public acceptance, is why many of the big R & D companies are pouring their money into these natural products. Currently on our farm, there are two main categories of natural products we work with. The first is what we often call biologicals and the second is plant growth hormones. With biologicals, we are using beneficial bacteria and fungi products to enhance root growth and nutrient uptake. For example, we add rhizobia bacteria to the soil so the bacteria can colonize on soybean roots, converting atmospheric nitrogen into nitrogen the plant can use. Another example is a fungi/bacteria seed treatment that effectively extends roots so they can explore more soil and bring in more nutrients. Plant growth hormones we use can help lengthen the stem, enlarge the root system, and improve the effectiveness of foliar fertilizer. We believe you will see a new era of ag products over the next 10 years. Companies are trying to find things that already exist in nature to solve many of our problems on the farm. Future weed killers could be made from an existing plant. More bacteria and fungi will be identified as beneficial to crops. Plant growth hormones and enzymes will be studied and application methods will be altered to give maximum crop benefit while potentially enhancing the environment. If you have been concerned about the safety of pesticides and the work done by big ag companies in the past, I think you’ll be excited to see the next generation of products. Even though the United States already has the safest, most abundant and least expensive (based on the percentage of a person’s income) food supply in the world, things should only improve, thanks in the part to the new wave of natural products coming soon. 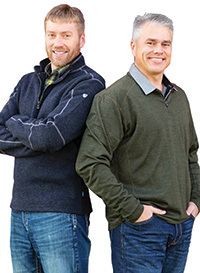 Darren and Brian Hefty’s AgPhD programs help farmers take their operation from good to great by sharing information ranging from how to maximize your fertilizer program and tiling to stopping those yield-robbing insects and crop diseases and more. If you’d like to learn where you can watch or listen to Ag PhD, you can find the listings at agphd.com.